The top floor of my gym is mostly just a line of lifting platforms and barbells — and this is where I spend most of my time when I’m there. There isn’t much in this world that makes me feel more badass than lifting a heavy barbell. Something about it just feels like home to me. But I’ve also been writing online strength training programs for women for a few years now and even after all this time, it’s still shocking to me how many women avoid picking up barbells. This phenomenon is further reflected in the fact that when I’m up there on top floor of my gym, I’m mostly surrounded by men. Occasionally, there’s a day when the platforms are occupied by some seriously amazing women — an awesome sight that brings me great joy. But it’s rare. 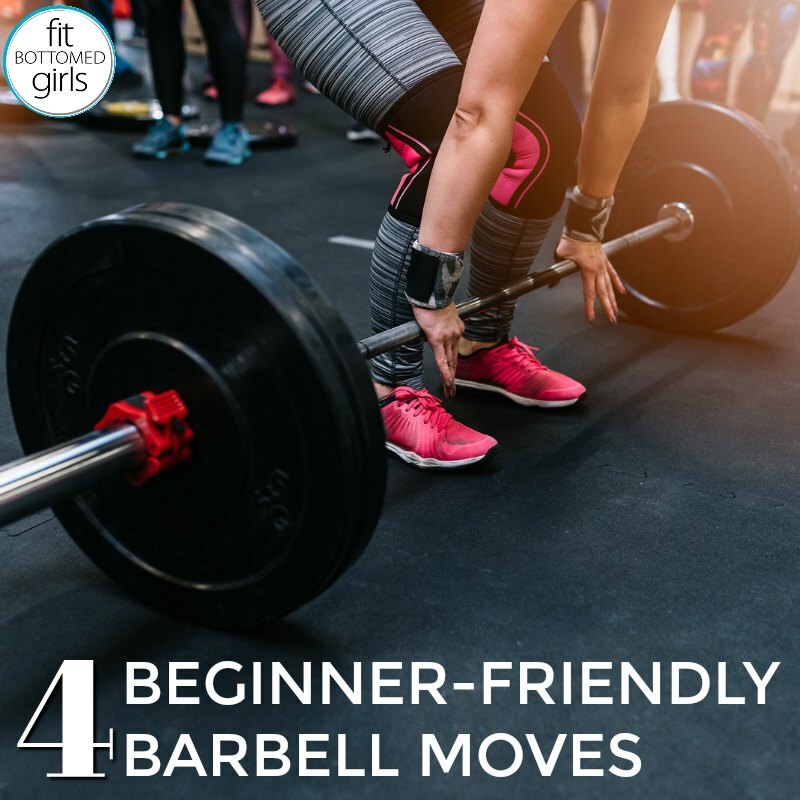 More women are lifting weights now than ever before but many still stick to the dumbbells — which are helpful and awesome, don’t get me wrong — but barbells also have a place in any well-rounded strength plan. I’ve detailed at length all the reasons why I love dumbbells and the best ways to use them in these posts, but there are also some very real reasons to love the barbell. So let’s talk about that today. Generally, dumbbells are considered more beginner-friendly, and I absolutely agree. Dumbbells force both sides of your body to work equally which is super helpful for helping beginners correct any muscular imbalances. In terms of comfort, dumbbells are easier to bail out of if you can’t complete a rep since you can pretty much just drop the weight without getting trapped underneath like you could with a barbell. Dumbbells are also awesome for developing your body’s ability to stabilize itself and the added load. But once you’ve mastered the exercises, a barbell will let you go much heavier. At a certain point, grip will become a limiting factor when using dumbbells. It’s really hard to get a good muscle pump going if it’s difficult to get the weight off the floor, let alone holding it in your hands. If you want keep making gains, you’ve gotta find a way to move more weight per rep. With the use of a rack to help, a barbell positioned correctly lets you worry less about grip and stabilization and focus more on moving bigger loads, thereby developing serious strength. For these reasons, if you’re doing both barbell and dumbbell work in your workouts, you should do your barbell work first and dumbbell work second. When you’re first starting out with barbells, I recommend working with a good personal trainer for a session or two. Having an expert to give you feedback on your form will not only help you avoid injury, but will also help you to lift more weight sooner. It’s better to not develop bad habits and then have to unlearn them later — start off on the right foot and invest in a few sessions. Trust me, it’ll pay off in big ways in terms of the strength you develop as well as in your confidence and comfort level. For detailed instructions and a demonstration of each move, check out the video I put together here or below. I recommend 3-5 sets of each barbell move in your workout. The more explosive the movement (ex. Push Press), the fewer reps you should do per set. I usually recommend 3-6 reps per set for the more explosive lifts like the Push Press and 5-10 reps per set for the more strength-focused moves like the Deadlift, Bent-Over Row, and Box Squat. Where you fall in those rep counts is determined by how heavy the weight is. Ultimately, aim to use a weight that’s heavy enough to make the last two reps challenging (but doable) to do with good form. For the Box Squat, it’s fine to start out with a smaller range of motion by using a higher box, but know that ultimately the goal is to work your way to a box that’s low enough to get your hip crease below the level of your knees — that is, unless you have knee pain or pre-existing knee issues (in which case you should consult a medical professional).